- Publisher Sally, a Christian, laments having an abortion years ago. ?I know the Lord has forgiven me, but I just can?t forgive myself.? What would you say to her? Maybe you yourself have struggled with ?self-forgiveness? and wonder how to deal with feelings of guilt. Why is self-forgiveness such an attractive notion? What, if anything, does the Bible say about it? Robert D. Jones identifies five possible assumptions behind the longing for self-forgiveness. In the process, he pinpoints a deeper problem-and a deeper solution to ongoing guilt. By dispelling a number of misconceptions, Jones clears the path to a joyful realization of complete forgiveness in Christ. About "Forgiveness: I Just Can't Forgive Myself (Resources For Changing Lives Series)"
Sally, a Christian, laments having an abortion years ago. ?I know the Lord has forgiven me, but I just can?t forgive myself.? What would you say to her? Maybe you yourself have struggled with ?self-forgiveness? and wonder how to deal with feelings of guilt. Why is self-forgiveness such an attractive notion? What, if anything, does the Bible say about it? Robert D. Jones identifies five possible assumptions behind the longing for self-forgiveness. In the process, he pinpoints a deeper problem-and a deeper solution to ongoing guilt. 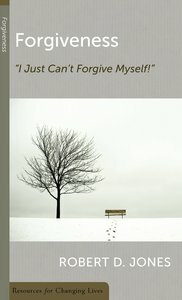 By dispelling a number of misconceptions, Jones clears the path to a joyful realization of complete forgiveness in Christ. Jones is pastor of Grace Fellowship Church of Culloden, West Virginia.